Interested in seeing the cool new features in the 2018 Sea-Doo lineup? Mark your calendars and plan to stop by the marina on April 21st, 9 am – 4 pm. The 2018 Sea-Doo lineup is built for adventure and fun. 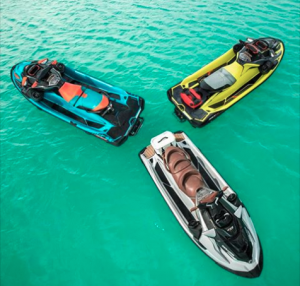 There is space to hang out, industry-leading stability, ingenious storage and a blue-tooth audio system to amp your next Sea-Doo adventure. Each new Sea-Doo purchase on April 21st will receive a new Sea-Doo cover offering savings up to $345. We’ll have the Sales Team on site if you have any questions, OnSpot Financing, and Door Prizes. Hope you will be able to join us!